Who can drive our karts? 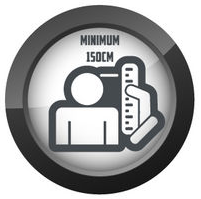 The minimum height requirement is 150cm to drive and drivers must be at least 11 years old. Our karts can reach a top speed of 55kph so this isn't for the faint hearted! If you have little ones after something a little 'slower' we have a 2 seater dual controlled double kart to give kids the authentic karting experience and Kids U Drive for 7-12 years so the youngsters don’t miss out on all the fun! Are there 10 or fewer of you? If so, you are welcome to "Arrive 'n' Drive". With the exception of the rare track closure or for private large booking, the track is open and ready for business. If you are concerned about availability, feel free to call ahead on 4055 0355. Our facility creates the best private location for corporate nights, private functions, hens or bucks nights, birthday and Christmas parties. We operate 7 days a week from 9am to 10pm offering night racing and wet weather racing. Our facility creates the best corporate nights, private functions, birthday and Christmas parties. Spectators can cheer on from our viewing deck located on the second floor over looking to track. We feel we are providing a new standard to the Outdoor Go-Kart Racing Scene and we are sure you will be most impressed with the features available.